On the 6th of October, a work by the mysterious artist known as Banksy was sold at auction for just over £1m. As the auction completed, the print of “Girl with a Balloon” began to slide down within the frame and was shredding itself while staff and visitors at Sotheby’s watched - some in awe, some with shock and (probably) some with a smile. ‘How very Banksy’ many would probably say, as the graffiti artist has remained un-named for many years and continues to confound the art world and the public. His works have captivated viewers around the world, and what was seen as a form of vandalism is now referred to as ‘street art’. Much of the work of this enigmatic artist is at times whimsical and in other cases a biting socio-political comment. A fundamental question is behind the work of Banksy, although it is not unique to his work, as it has been a part of art and design (probably) since the first works work created. That question is “what is the role of art and design?” Works like Banksy’s ‘self-shredding’ print would suggest that art and design can be about challenge - forcing us to confront questions about social values, political ideologies and personal beliefs. Modern art is, to some extent, fundamentally engaged with this question. When, in 1961, Piero Manzoni created ninety numbered, signed and sealed tins, allegedly containing 30g of the artist’s faeces, he challenged the public to recognise that art is what we decide is art. (Incidentally, one of those cans sold for in excess of $300,000 recently.) Much of the work of Andy Warhol was predicated on using mass production processes to create multiples that are undifferentiated and ask us to question the value of the ‘one-off’ or the unique. In the Tate Modern, there is a shelf with a glass of water sitting on it. On the wall is a statement by the artist, explaining that it is an oak tree. “An Oak Tree” (1973) by Michael Craig-Martin is, in my view, the epitome of conceptual art; and a work that pushes at the very bounds of our understanding of what makes art. As the artist has pointed out, the work is comprised of the objects (shelf and a glass of water) and the text. The ‘art’ exists in the relationship between the two. "I considered that in An Oak Tree I had deconstructed the work of art in such a way as to reveal its single basic and essential element, belief that is the confident faith of the artist in his capacity to speak and the willing faith of the viewer in accepting what he has to say. In other words belief underlies our whole experience of art: it accounts for why some people are artists and others are not, why some people dismiss works of art others highly praise, and why something we know to be great does not always move us. " Design might seem to be a less obvious vehicle for this type of challenge. Because design is often understood to have a functional aspect, to challenge or deny the function would mean it was no longer be ‘design’ (and we might suggest it becomes ‘art’). However, there are instances where design works challenge our thinking about design, and the context of design. Product and industrial designer, Ralph Ball, has produced a range of works that play with our notions of the relationship between function and interpretation. Take, for example, Ball’s “Table of Contents”, an alternating stack of books and glass plates. On the one hand, it is clearly a table. However, the books (contents) are rendered inaccessible without dismantling the table. Thus, the content of the books is relegated to acting as a functional element to support the glass of the table. It is the ultimate collection of ‘coffee table books’. Ball’s “Transparent” is a glass-topped table whose supports are bottles of window cleaner. As the glass, bisects the bottles of cleaner, we cannot use them to clean the glass without destroying the table. Here, we are faced with a question about what actually supports a glass-topped table. Is it the ‘legs’ that define the ‘table-ness’ or is it the fluid that allows us to maintain the ‘glass-ness’ of the table? Art and design each have a purpose. However, that purpose is not simply to be viewed or to provide a functional solution. At times, the line between art and design can be blurred - art can be functional - design can be conceptual. While some might argue that art should be beautiful, and design should be functional, we should not lose sight of the possibility that the beauty of art or the function of design might be to challenge us. What is more beautiful or functional than to look more closely at the world around us, ask questions and be surprised? 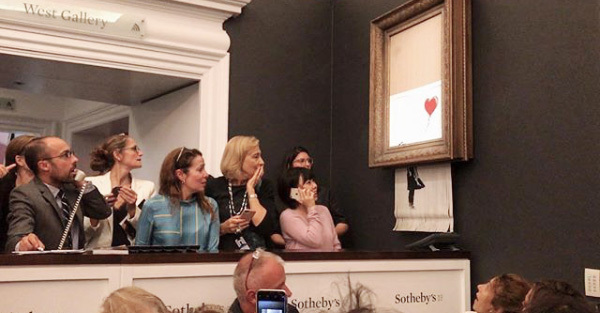 Postscript: “Girl with Balloon”, after shredding, is now entitled “Love is in the Bin” and the owner of the £1.042m work remains pleased with the purchase. Geoffrey is a qualified architect, who has worked in the US and UK on projects in the US, UK and Asia. He has been involved in teaching, leadership and management of higher education for more than 20 years; and was the Course Director for undergraduate architecture at University of the Arts London from 2004-2016. He has taught and lectured in the UK, Canada, Brazil, Hong Kong, Spain, and South Africa. He is the author of ‘The Design Process in Architecture’ (2018) and ‘Architecture: An Introduction’ (2010) as well as numerous articles for magazines and journals.